Adding bananas into this melt-in-your-mouth tender beef or pork stew brings so much flavor and richness to this Asian classic. This Filipino stew is a huge family favorite and a dish you’ll make over and over again! Sundays were very special in our family when I was growing up in our small island called Marinduque in the Philippines. Not only because that’s the day that we all dress up and attend church but also because we know that Mom would have something special for us for lunch. It was always a much anticipated meal. And though oftentimes, the weather in the Philippines is hot, still we would have something hot for lunch – like Bulalo (Beef Marrow Soup) or Sinigang (Pork Sour Soup). We don’t mind it at all. We found it quite refreshing to have a steaming hot bowl of either of this soup. We look forward to Sundays because of this. However, on certain occasions instead of the usual soup my Mom would make a stew instead. And as far as I can remember this is the stew she would make especially on a Sunday – Pochero – a tomato based stew that uses either beef, pork, chicken or a combo of all three plus a variety of vegetables. What makes it unique from the usual tomato sauce based stews is that it has Burro Bananas (Saba) or sometimes called Sweet Plantain as part of its main ingredients. It’s simply not Pochero without it – it will just be a regular stew but not Pochero. And this is what truly sets Pochero apart. I just made this for my family the other day and they all loved it especially my husband who had an extra serving because he truly enjoyed it. I know it seems weird to add bananas to a stew but these Burros are hardy cooking bananas and I tell you they are what makes Pochero extra special. Try this for your Sunday lunch or dinner and am sure you’ll love this! 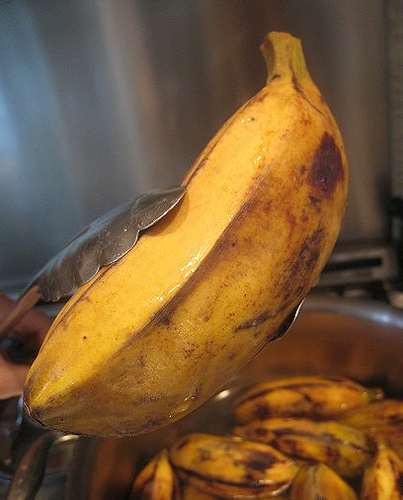 Here’s a photo of what a Saba Banana looks like. Photo is from Eating Club Vancouver. *Beef or even Chicken or a combo of any two or all three may be used instead. *You can replace the Carrots with some Green Beans and/or Garbanzo Beans – which are the usual ingredients for Pochero. Heat the oil in a deep pot like a Dutch Oven. I used my Le Creuset. Sauté the diced onion for a minute and then add the garlic. Add the pork cubes and coat it with the oil and the aromatics. Stir in the tomatoes and continue to cook until the pork cubes have turned light brown. Pour in the Fish Sauce (Patis) and sprinkle the ground black pepper. Stir. Let it simmer for about 3-5 minutes. Add the broth or water and bring to a boil. Simmer covered until pork is tender (about 30 to 40 minutes). When the pork cubes are tender, add the potatoes and carrots. Pour in the Ketchup or Tomato Sauce. Stir. Simmer again for about 5-6 minutes or until the potatoes and carrots are slightly tender. At this time check the flavors and adjust the seasoning to your taste by adding either salt or sugar or more fish sauce. If it’s a little sour (esp if using regular ketchup or tomato sauce) add some brown sugar to achieve a balanced flavor. Add the sliced Burro Bananas and continue to cook until it’s tender. Add the Bok Choy leaves, turn off the heat and cover. Let it stand for about 5 minutes. The remaining heat will cook the Bok Choy. Transfer to a serving dish and enjoy with rice! Yum! Some Filipinos eat this with a little fish sauce on the side mixed with a few drops of freshly squeezed Lime juice. Delish! One of my favourite Filipino dishes! Shame that saba is not easily available in my area. Pochero isn't pochero for me without it. BTW, I'm a Malaysian residing in Belgium. Thanks, Nasifriet! So glad you found us, hope the blog helps you get more acquainted with Filipino cooking. I was checking out Dutch oven pictures in Google. Would it be a bit similar to our local kaldero? It's a cast iron but the concept is similar. The Dutch oven can be used inside the oven but am not sure about our kaldero. Thanks for stopping by April. As I now comment, there are two kilos or so of cubed beef simmering in my slow cooker. Previously marinated in a Worstershire and Knorr combo, slathered with minced onions and smothered with finely chopped garlic, I have added a can of tomato paste. I will adjust the taste and flavorings later, before I add the chicken, pork and the Saba bananas. Also, fried camote, whole sweet pickles, red and green bell pepper, and olives. Sounds delicious! I have to try that! Thanks for stopping by. Where do you buy most of your ingredients for your Filipino dishes? I know a lot of things you can find at a local grocery store, but what about the saba bananas? I recently returned from the Philippines, where I lived for 2 years and have been craving many dishes. This looks like pure comfort food! Love the addition of fish sauce here, too. It always adds such deep flavor! I have never seen sweet plantains in a stew, so I am super intrigued. Weirdly I love them despite hating bananas! This stew looks awesome! This looks like it has rich, deep, and hearty flavors. I am happy to finally know what those little bananas are used for! I was at my local Mexican market today and they had a big pile of green burro bananas. I bought four and came home to find a recipe found then when I can across your blog. The stew look great, but a I'm a vegetarian. Are there any substitutions for meat that are common in Filipino cooking? My local Thai restaurant uses winner squash in their curries and that works well. What do you think of that idea? I have never made this vegetarian but I think the squash or sweet potato would be a great idea. Anyway, there are other veggies already in the stew so it's great to convert it to vegetarian. Do let us know how it goes Scott and thanks for asking.